Hotels, Restaurants, Stores and Shops are very busy spaces where repeated steps and movements constantly put the flooring to the test. When a refurbishment is needed, these spaces are challenging as the renovation process needs to be as short as possible to continue welcoming customers. iD Click Ultimate, Tarkett’s new Rigid Composite Core Luxury Vinyl Tile collection, is the ultimate flooring solution for these spaces that are always bustling with activity. The collection’s new click system and its very robust construction makes it especially suited for renovations as it is easy and quick to install on any subfloor*, thus minimising the impact of business downtime. Plus, iD Click Ultimate was designed to be everything-proof and to resist repeated shocks as well as noise. All of these features make iD Click Ultimate the ideal flooring solution for spaces such as Stores, Shops, Hotels and Restaurants. Shock-proof means that iD Click Ultimate is a heavy duty vinyl flooring that is extremely robust. It is a Class 34 flooring and therefore can be used in heavy traffic areas where heavy static or dynamic loads are handled on a regular basis. iD Click Ultimate is also highly resistant to all kinds of shocks thanks to the Rigid Composite Core innovation combined with the PUR surface treatment. 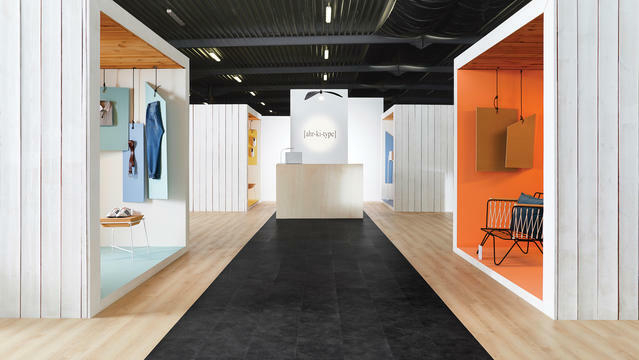 iD Click Ultimate is acoustic flooring thanks to its built-in acoustic backing SoundBlock Technology to reduce noise as well as dampen noise levels in rooms and between different building floors by 19dB. This makes iD Click Ultimate particularly suited for Hotels where tranquility is key for customers or Restaurants where diner comfort can be compromised because of the ambient noise. No need to add any acoustic floor insulation or underlay as it is already integrated in the floor, thus saving installation time and costs on all projects. iD Click Ultimate is a 100% Waterproof flooring* and therefore suited to any space including where water is spilled on a regular basis, like bathrooms, kitchens, hotel lobbies or store entrances for example.